We closed our pool almost two weeks ago this Wednesday. It is the same guy who closes our pool every year. I like his service and it is affordable too. This is his part-time job. He teaches kids and pool opening or closing is his part-time job. It takes him two or three hours to close finally the pool. I do help him as much as I can. There are many things to take out and store securely. 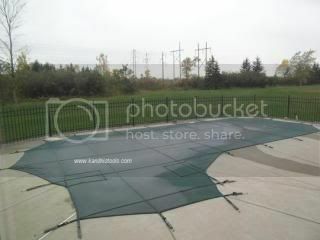 The pool cover is heavy too. He has to close our solar panel as well. The solar panel saves us to heat our pool. Overall I am very impressed with this guy’s service. My kids will surely miss the pool. I am sure that they cannot wait for the pool to open again next year. I paid him $165 and tip him for being a good worker. I will never close or open our pool by myself. I always let the professional do their job. I do not mind paying. Have your pool closed yet? Who closed your pool? How much you paid? This entry was posted in panel, pool, services and tagged pool closing, solar panel. Bookmark the permalink. time to close that pool ky ang dairy queen nag close na sd hehehee. what’s the connection? well it’s cold season no one would want to hang out in the ice cream parlor or freezing water in the pool. Oh, I didn’t know that you have to close a pool. Well, for people at the other side of the world perhaps. We don’t have a pool & living in a tropical country doesn’t require us to close a pool if we have. Wait, do you close it for the winter? Sorry, I really don;t have an idea. Hihi. Good thing there are experts in that matter. Oh I wish our pool is working but it has been a long time..
We don’t have a pool but I wish we had one. I am sure my boy will have lots of fun palying with water everyday!! Unfortunately we do not have pool .It was the first time I heard closing a pool. What a hardworking guy he is for having two jobs. The fee is quite expensive but i bet he deserves it including the tip…so nice of you. Good thing that there are affordable services for that Mommy Jess. We don’t have a pool and I think we will not have one if we live here in our house for long. I believe it’s a must to keep the pool tidy and in shape while welcoming and letting winter season pass. Thank God we don’t have a pool. 🙂 Seriously, it is sometimes better to hire professionals than do things yourself. That is really expensive just to close the pool. Is it difficult to do it yourself? Now I’m curious, I’ll have to research that. No pool in our end, I’m afraid. Because if ever we have one, it’ll be close for all year round because of our cold weather even in summer. We don’t tend to get very hot day here in UK, we are only lucky if we can count 10 good summer days where I can wear sleeveless and no cardigan or jacket to carry along all the time. Well, would love to have a pool but we just don’t think it is worth the hassle. Anyway, it is good that you rely on the professional as they tend to know how to close the pool properly and $165, I think that is reasonable price. Wow, it must be very cold there by now, Mommy Jess! Glad that you got that done… I am sure the kids would be missing their swimming time! There are things that should be better left to the experts. I also don’t mind paying that much if the job gets done effectively. I actually didn’t know that you have to close the pool for winter if I didn’t read about this 🙂 I guess not having a pool at home and living in a tropical country left me so clueless.. Haha.. Anyway, thanks for this info sis! 🙂 I’ve learned something new today.